When studying the interior of the earth the best model for understanding the layers might be______________? Why is the crust located above the mantle? It is brittle and breaks easily. 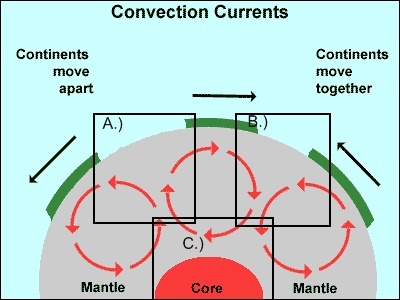 Which part of the diagram best describes the relationship of the convection cells at a convergent plate boundary? None of the squares shows the proper convection cell for a divergent boundary. How old rocks are; which are oldest which are youngest. How rocks are constantly changing form, from one into another. How impractical it is to make machines from stone.